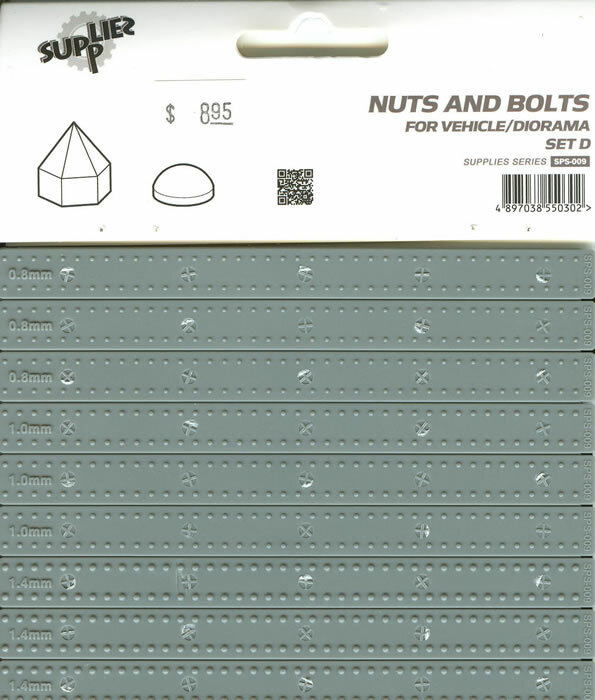 Home > Reviews > Modern > Nuts and Bolts Sets C and D. Meng Model, 1/35 scale. Media and Contents: More than 1200 parts in each set. There is a common disease that affects many modelers after a few years – the dreaded AMS. AMS of course stands for Advanced Modeler’s Syndrome, where you are suddenly hit with a compulsion to do everything from the ground up with as much detail as possible. One of those things is usually replacing nuts, bolts and rivets with more properly shaped parts, or adding them where the model manufacturer has been remiss. But it is either not easy or not cheap. Styrene sets run from $2 to $4 for a set of 100 to 200 items, all in one size and shape, and they are usually molded on sprues. The idea is to cut off the part with the sprue, drill a hole, and then install the new part. But this can be tedious and prone to error if the drill misses its mark. There are also resin ones, which require the use of ACC, but if bumped or not set when touched they move around and can “grab” in the wrong spot. There are also brass ones, and even miniature nuts and bolts but these tend to only be of great use for larger scale items (1/20 and larger). The old standbys up to this time have been either using a punch and die, such as the tried and true Historex Agents one, or using Plastruct styrene hex rod and a NWSL “Chopper” to make bolt heads. But these have their limitations – the former when you need hundreds of bolt heads, the latter when you are trying to get the right thickness and size. These four new sets from Meng may solve many problems. 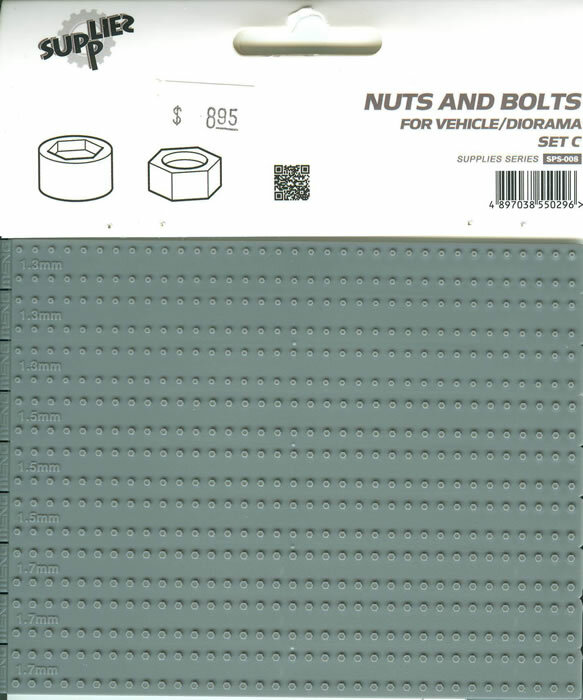 They are A - nut and bolt, bolt head; B - nut/bolt/washer, bolt and washer; C - hex nuts and Allen head bolts; D - crown bolts and rivets. Each one comes in the same format. A set of nine plates are molded into one sheet with “snap off” grooves between them, and each plate is double sided with about 70 items on each side. I picked up Sets C and D and found that each one comes in three sizes: 1.3mm, 1.5mm, and 1.7mm; in 1/35 scale that equals 45mm/1 3/4", 52.5mm/2", and 59.5mm/2 1/4", all of which are pretty good size bolts and nuts for detailing vehicles. Meng has done a nice job with the snap-off plates, as you can use a fine razor saw to remove the parts from the plate and since nothing is more than two deep with one on either side of the plate all of them are accessible. It does require care in removing them to both get a level cut and also not to have them sacrificed to the carpet monster! Overall this a great idea, and given the huge number of parts on each card very economical.